Located just an hour away from Lisbon in the Setúbal region is the charming village of Azeitão. It is nestled among olive and cork trees at the foot of the Arrábida Hills. The village is well known for red wine, olives and its prized creamy sheep cheese, which is considered one of the best in the country. The area is also home to some of the finest quintas (villas or country estates) in the region. Explore this beautiful region and learn more about its wines on either a 5 or 7 hour private tour. Your guide/driver will pick you up at your hotel, show you around the region and take you to one of the area’s wine cellars. The visit will include a tour of the lovely country estate, where you will learn about the wine production process, and wine tastings so you can sample some of Portugal’s best table wines. The private tour can be customized to meet your specific interests. 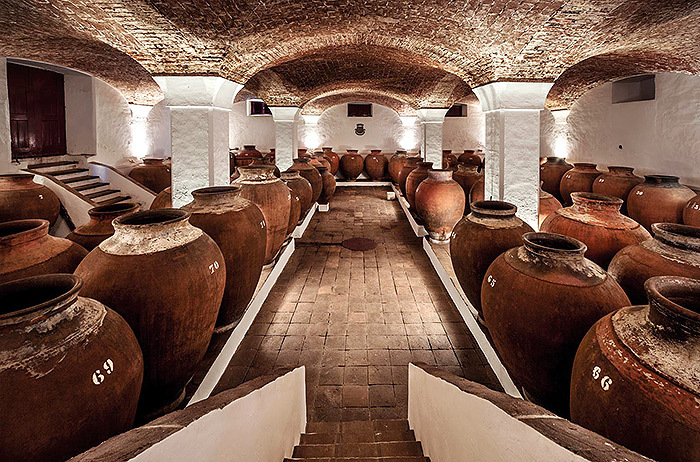 Choose from a visit to either the wine cellar of José Maria da Fonseca, a family business that is the oldest producer of table wine and Setúbal Moscatel in Portugal, or Bacalhôa Vinhos, a family controlled business that was founded in the 1920’s and is one of the most innovative wine makers in Portugal. A tour of the estate and a wine tasting will be included in the visit. Note: A 7 hour private tour with a wine cellar visit is also available. For more information, click here. Photo credit: © José Maria da Fonseca · All rights reserved.